OVER THE last few days I’ve been visiting friends in a small pristine town in the southwestern tip of Sweden along the Baltic Sea called Falsterbo, often referred to as the Swedish Riviera. Falsterbo is mostly known as a holiday destination where Swedes and a small assortment of other nationalities, like me, go to spend their summer vacations. The beaches of Falsterbo are known for their white sand and family-friendly bathing opportunities, which I’ve observed begins in the early morning and then again before or after dinner. Falsterbo is also known for one of the better golf courses in Europe – Falsterbo Golf Club — as well as for the annual International Horse Jumping Grand Prix (part of the Falsterbo Horse Show) every July. All interesting stuff, perhaps, but the one thing I want to focus your attention on is the activity level of the older Swedes here. Age slows nobody down. The elderly are commonly seen shuffling thru the pure white sand to the sea, some bent and hobbling, but steadfast in their aim to wade into the warm and gentle waters and swim for hours on end. This got me thinking about the importance of regular physical activity irrespective of age. You must exercise if you want your Golden Years to be healthy. We must exercise for longevity to fight sarcopenia (muscle wasting), deteriorating cognitive capacity and disease. We must exercise to prevent our bodies from becoming pudgy as fat replaces muscle. There’s even a type of protein that has been shown to slow the aging process by slowing down muscle degradation. 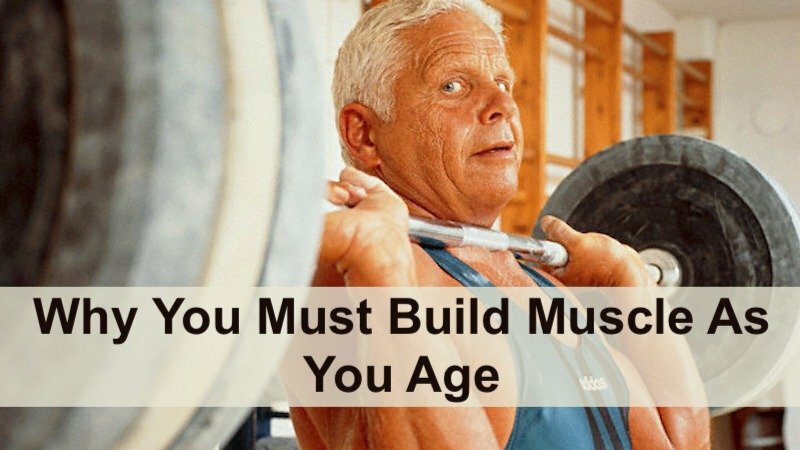 Go here and here to get some exercise routines and ideas so you may build muscle as you age. I presume you’re sitting while reading this. Just sitting there, doing nothing much more than moving your eyes, still burns calories a bit — and the more muscle you have, the more your burn, just sitting. Surely, when your metabolism declines, all other things being equal (such as the number of calories consumed), fat happens. But the body is a complicated thing where nothing happens by itself or in isolation. It’s not just a slower metabolism that contributes to making us fatter as we get older and our ignored muscles vacate the premises. Insulin does us in as well. Muscles consume glucose (blood sugar) big time, but glucose needs insulin in order to enter cells and be used as energy. If your muscle mass erodes but the amount of blood sugar stays the same, there’s less capacity to use it and you become insulin resistant. This puts you at greater risk for Type 2 diabetes, which in turn raises your risk of heart disease, stroke and, perhaps, Alzheimer’s. A pretty good incentive to build muscle as you age, yes? You need to exercise for longevity because regular exercise changes the brain to improve memory and thinking skills, says Harvard Medical School. In this study, scientists conducted a thorough review of the relationship between the lack of exercise and chronic disease. While you might think that it’s near impossible to build muscle as you age, particularly in your seventh decade and beyond, the truth is that muscle will grow as long as it gets sufficient stimulus. Walking slowly down a flat road is not sufficient stimulus to build muscle as you age, but walking quickly up a steep hill will build the muscles in your glutes, thighs and calves. Lifting dishes over your head to place them in a cupboard is insufficient to build muscle as you age, but pressing dumbbells heavy enough to limit your repetition capacity to ten will build the muscles in your shoulders. Pressing yourself away from the wall will not build your chest, but push-ups will, even if done on your knees to start out. If you have such a great diet why do you feel the need to take supplements? Hormones too? How old are you by the picture I’d say 30’s and how about just a healthy body and mind. When you hit the 60’s youthfulness doesn’t exist in 95% of the people. I’m 62. Don’t know which pics you’re referring to, but some on the website are as old as 10 years. The one of me in front of the Golden Gate Bridge was taking 4 years ago. Your question is well timed as I’m in a remote sea-side village in Sweden on an Alpaca farm trying to make some headway on my book (www.ageproof.me) and am wrestling with the Supplements Chapter. Diet is the most important thing, but certain biochemical/hormonal things decline w/ age and can be boosted w/ supplements. Moreover, most of us have not followed an ideal diet and are heading for some sort of heart disease and/or prediabetes. Certain supplements (herbs) can do a lot to improve LDL (lower it), plaque and blood sugar. Supplements like creatine can improve body composition if you do resistance training. If you want to get a sense of it, go to Examine.com and search for your topic of interest. down but it wasn’t working. About a year ago I read on-line on how the body can switch between either glucose or fat. Also similar to what you are saying that as long as insulin is traveling through the body, caused by carb intake, there is no fat burning process going on. If you eat lots of carbs, then exercise is not going to help the weight disappear. And the biggest culprit in the inability to lose weight and the cause of many illnesses is sugar! The food industry knows sugar is addicting but continues to put it in all our foods. Scientific evidence now shows eating fats is not a bad thing, but having sugar with the fats is bad. I would not even feel hungry between meals! I have found that there are many new diets that are popping up now, like the Paleo diet, the Whole30 diet, the Pagen diet (Dr. Mark Hymen) and the Ketogenic Diet, all recommend not consuming sugar.Thanks to the Food Industry and their greed for profits, our children are becoming obese and addicted to sugar. I first tried being a Vegetarian, but became more of a Carbatarian. At the beginning of this year I cut out sugar, added fats and some protein back into my diet and lost 65 lbs.! I don’t have any more sugar cravings and my lab work results show I am healthier for it! Who knew that when we were being told that we should eat a low-fat diet, that we should really be eating healthy fats and a low-glycemic diet! I’m just getting my frustration out from being tricked by all the Food Industry ads on TV all these years. I just turned 62 and I’m healthier now than when I was 50. You can feel youthful in your 60’s (I do!) but you must take a holistic approach to health and really have to work at it. By the way I take about 30 supplements every other day and am certain it has a positive affect. Different people respond to different things in terms of macronutrient combinations, some doing well on high carb/low fat; others with the opposite. If you haven’t already, try making sure you have protein w/ every meal, drink a large glass of water before eating (helps satiate and also thirst often masquerades as hunger), stop eating within 3 hours of bed time and try Intermittent Fasting a few days a week. Search my site about this. I’m the same age, Steve, and usually feel pretty good. Yes, if by “holistic” you mean addressing the body/mind/emotion/spirit parts, completely agree. All tied together.